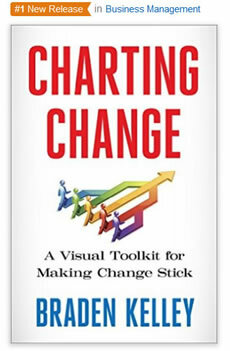 Charting Change will introduce a visual, collaborative Change Planning Toolkit™ designed to help get everyone literally all on the same page for change. The toolkit begins by painting a different background for the landscape of organizational change. Here we introduce the first of more than fifty tools and frameworks comprising that make up the Change Planning Toolkit™. When it comes to organizational change, most people focus on change management and there is even a couple of professional associations organized around the practice of change management, including the Association of Change Management Professionals (ACMP). Leave one out and eventually your change effort, no matter how big or small, will eventually fail. If you’re setting setting out to change the world, even a small corner of it, then you’ll want to be sure to consider each of the five keys and make sure that you proceed in a measured way that takes each into account. Change Planning is the first key to successful organizational change, and it focuses on drawing out the key issues of the necessary change and puts some structure and timeline around them. You will find you have a better experience and a more successful outcome if you use a more visual, collaborative method using something like the Change Planning Toolkit™ I will be releasing soon to help you create the necessary change plans, goals, metrics, etc. Change Leadership is the second key to successful organizational change, and is important because good change leadership provides the sponsorship, support and oversight necessary for the change activities to receive the visibility, care, and attention they need to overcome inertia and maintain momentum throughout the process of transformation. Change Management represents the third key to successful organizational change, and it is probably the one most people think of when they think about organizational change because it focuses on managing the change activities necessary to achieve the change objectives. The term itself has some challenges however as the term also refers to the management of code changes during the software development process and its relationship with project management is confused. 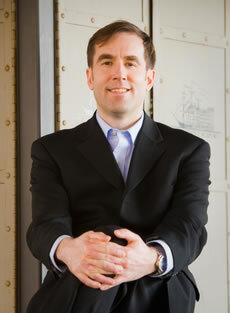 We will dig more into the relationship between project management and change management in a future article. Change Maintenance represents the fourth and probably most neglected key to successful organizational change. Many change leaders lose interest after the major launch milestones are achieved, and this is a real risk to sustained success of the change effort. During the change maintenance phase is when you measure the outcomes of the planned change activities and reinforce the change, to make sure the change effort has met the change objectives and when you ensure that the behavior change becomes a permanent one. Neglect this phase and people often slip back into their old, well worn patterns of behavior. Every organization will have a broad collection of larger change efforts (digital transformation, merger integration, layoffs, etc.) and smaller change efforts (including all projects) underway or in the planning or maintenance stages at all times. 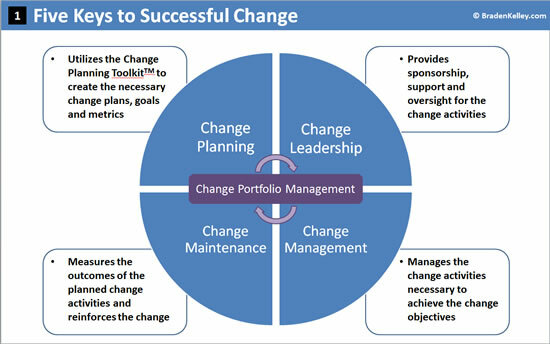 This portfolio of change efforts must be managed and Change Portfolio Management represents the necessary activities for balancing all of the resource needs of this variety of change efforts. This is the first step in the Change Planning Toolkit™ approach to organizational change that you can use to help change the world in the series of Big C and Little C change efforts that you may lead throughout your life. Big C change efforts are what most people think as change initiatives (mergers and acquisitions, layoffs, transformations, etc.) while Little C change efforts are any project that you might undertake (after all every project changes something). If we want to do better than the 70% failure rate that change practitioners face in their work, we must look beyond change management or change leadership, and instead think more holistically about change, and to consider all Five Keys to Successful Change. I hope you have found the article and the framework a useful first building block as we work together to build a strong foundation for successful organizational change. 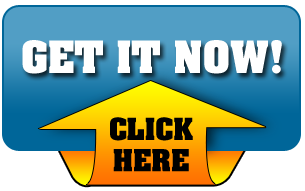 To be alerted when the Change Planning Toolkit™ becomes available, please be sure and click the link below to join the mailing list, and stay tuned for the next article in this series! 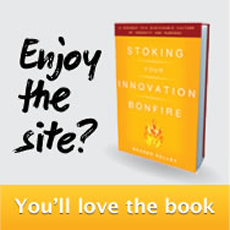 This entry was posted in Change, Innovation, Strategy and tagged change leadership, change maintenance, change management, change planning, frameworks, portfolio management, Tools. Bookmark the permalink. 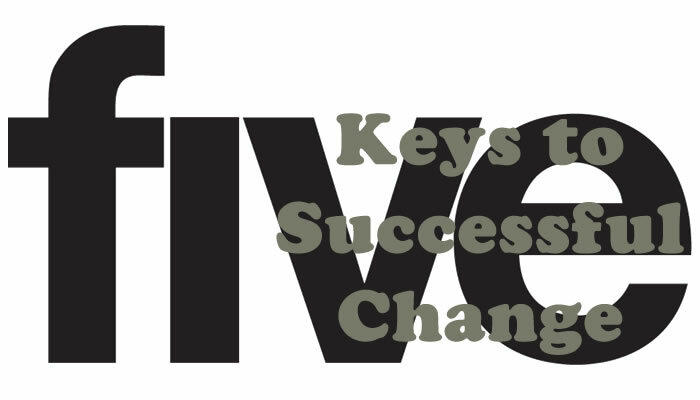 Organizations that proactively focus on all five keys will have more successful project execution and more successful change effort implementations, achieving greater adoption and realization of the intended project outcomes. Looks like worth reviewing. I am a HS teacher of Milwaukee Public Schools reviewing for myself and students how to crossover entrepreneurship thinking styles into one’s daily lifestyle.